The Avondale home of Dorothy and Robert Craft is getting an extensive makeover. Three generations are working on the Kennett Square home: Howard Morrison, his son Scott and granddaughter Lana. On the roof of the Craft home, volunteers nail down new shingles. The Craft home is getting a new porch this week. Two teens paint the door frame of a home in Kennett Square on Monday afternoon. Adults supervise the teens as they work. This week, while their friends are lounging poolside or working summer jobs, 51 high-school students are volunteering to repair homes for needy families in southern Chester County, and changing lives in the process. Every summer, the Good Neighbors organization, based in Kennett Square, sends out groups of teens to fix homes in what executive director Rob Ellis calls “our signature event for the year.” Good Neighbors works all year long to make homes “warmer, safer, drier, healthier,” as stated in their mission statement, but the intense one-week summer event is the group's most visible project. This week, four homes – in Kennett Square, Oxford, Avondale and West Grove – are getting the all-hands-on-deck treatment as teens get instruction from experienced adults and then get to work, putting up siding, painting, cutting wood or hammering shingles. The teens come from area church youth groups as well as The Garage in Kennett Square, and they each pay $175 to bunk at Avondale Presbyterian Church at night and work every day. Ellis said Good Neighbors works so well thanks to donations of materials and volunteer labor, keeping costs low. There is plenty of know-how among the adult volunteers, many of whom have home repair or construction experience. The teens are quick learners, and there are always adults to do what the teens can't do. For homeowners who are facing tough times, the renovation help is deeply appreciated. “Our prices are hard to argue with,” Ellis said, smiling. “Folks understand when we do some of the prep work on their homes but wait a couple of months until the summer camp to do the big work when we have the extra help. Good Neighbors fields 15 to 20 inquiries for help each month, Ellis said. Of those, only some will meet the criteria. The group serves only southern Chester County. A similar group, Good Works, serves northern Chester County. “We're not related, but we're friendly with each other and support each other,” Ellis said. Each day starts with a devotional circle, Ellis said, and there's an honoring ceremony on Thursday as the teens and homeowners mark the work that's been accomplished. 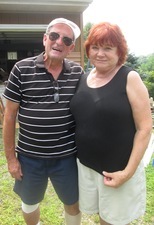 Veronica and John Malchione are getting much-needed home repairs this week. Monday was the first day of the work camp, so under a blazing sun, teams of adult and teen volunteers got to work. At the Avondale home of Veronica and John Malchione, the outer wall of the garage had new vinyl siding, with the whole house due to be covered by the end of the week. Veronica explained that, due to John's serious illness about six years ago, the couple had burned through their savings for medical expenses, leaving their home as their only asset. Because they were unable to do routine maintenance on the home, it had deteriorated. “It was God,” John added, nodding. The couple contacted Good Neighbors, and last fall, they found out that their home would be one of the sites for the summer work camp. But not everyone at the site was young. Howard Morrison, 80, said good-naturedly that, “Since I'm the oldest one here, I've made the most mistakes.” Morrison has been volunteering with Good Neighbors for about 10 years, and he is working side by side this week with his son Scott and granddaughter Lana. 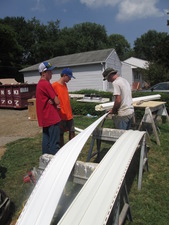 Workers cut siding for the Craft home. At the same time, over at the small Avondale home of Dorothy and Robert Craft, a team of workers seemed to be everywhere at once. The Crafts, who are 88 and 90, sat in their living room while team members hammered and sawed outside and in the cellar. The project started as a roofing and siding job, and previous work crews had removed two layers of worn-out shingles before work camp started. But the job had gotten considerably bigger. The Crafts are getting new siding, a new roof, a new front door, a new bathroom and kitchen, a sump pump, furnace and some new plumbing. Ellis said work would continue on the home after the work camp week ended, but that most of the work was well underway. Also outside the Craft home was Bill Stecher, the operations director of Good Neighbors. He is a home inspector, “so I have connections,” he said, smiling. He's in charge of making sure each job site has the tools needed. “Once we get started, we stock the jobs for what we know about, and then once things start to open up, I run around and keep them supplied,” he said. Dorothy said she learned about Good Neighbors because she used to work in Kennett Square and passed by a house that had a sign from the organization out front. “Later on, when I went into the hospital and came out, my niece started talking to me about getting some work done. That's how we got in with Good Neighbors,” she said. As Robert spoke, a worker from the Good Neighbors team came in with a gift – two keys. “Mr. Craft, here are the keys to your new front door,” he told the elderly man, who looked up and beamed at the news. For more information about Good Neighbors, visit www.goodneighborshomerepair.org.